What do Benedict Cumberbatch and Twiggy have in common with Handel and Charles Dickens? They are all supporters of 275 year old children's charity Coram! Stampin' Up has asked a number of celebrities to make cards which will be auctioned between 6th May and 16th May 2014 to raise money for the charity which helps some of the UK's most vulnerable children in many different ways. Find out more here and check out Mr Cumberbatch's and Twiggy's fabulous artwork as well as cards made by a host of other celebrities. If you go along to the Coram website, you'll notice that its colours are bright and positive orange and red so I used those colours and some of the design elements on the site to make my card. While you're there you can read a bit about why Thomas Coram set up the charity back in 1739 and what it's trying to achieve in the present day. This was a very quick card, suitable for my Three Minute Thursday slot today. I cut strips of card stock and glued them to a curved square base. 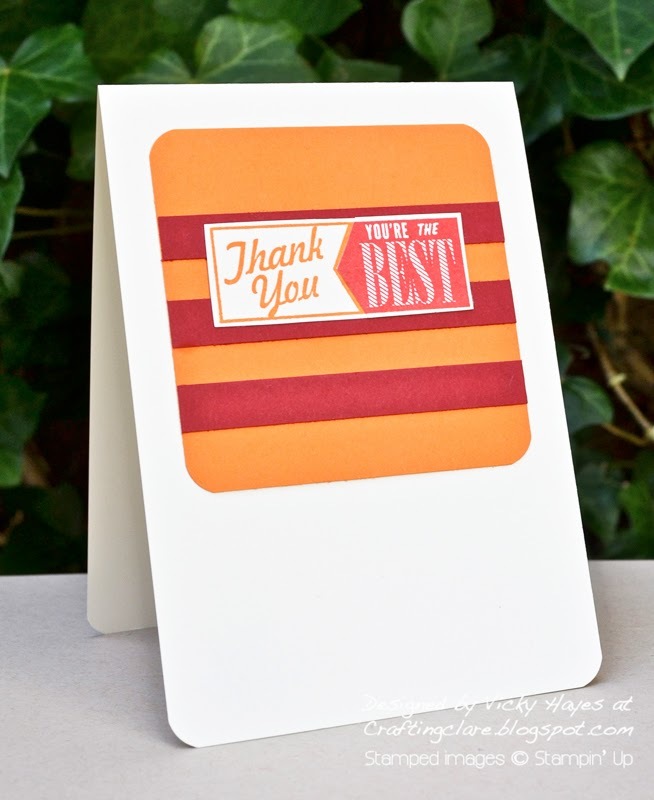 That was topped with a fabulous graphic label from Hello Lovely which was stamped twice in Pumpkin Pie and Real Red, then snipped and spliced together for a two-tone effect. My daughter's boyfriend brought his three year old sister round to play yesterday and I was transported down memory lane. All our favourite stories were read aloud; a little house was built under the kitchen table and 'porridge' made in a saucepan and dished out onto our picnic plates; our cat was (much to her horror!) petted by eager but clumsy fingers; bubbles were blown and chased after in the garden; my boys' old wooden garage and road system was put together and played with; there was a special lunch out followed by a trip to the playground. I was thinking about all this as I typed up today's post - this is childhood as experienced by the lucky ones.